Erin’s World frames are specifically designed for the special facial characteristics of children with down syndrome and other special needs. 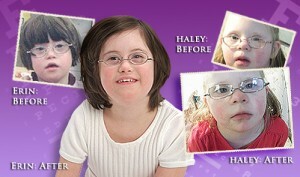 The frames were designed by the mother of Erin who was diagnosed with Down Syndrome at birth. After years of trying to find a spectacle frame that fit Erin correctly she decided it was time for her to take her knowledge of spectacles frames and the love for her child and design her own range. Erin’s World spectacle frames have a lower set nasal bridge ensuring that your child looks through the centre of the lens and gaining optimal use of their prescription and sides that are suitably modified to stop the frame from slipping down. Erin’s World frames are made to be more flexible than the standard frame to ensure that they withstand the daily activities of your childs life. If you, or the person you care for has a disability and would like further information on our specialist frames and services, please click here. Tomato Glasses are designed specifically with babies and children in mind. Tomato Glasses are a lightweight comfortable frame made intentionally with no pressure points for maximum comfort, adjustable and interchangeable nose pads to help children look through the centre of the lenses, comfort ear tips for when your little one falls asleep and a strong sturdy frames to help with their busy lifestyles. Each frame comes with an optional headband to help your child keep their spectacle frames on. They come in a variety of colours with fun patterns on the side to encourage your child to wear them, pink hearts, blue cars etc.